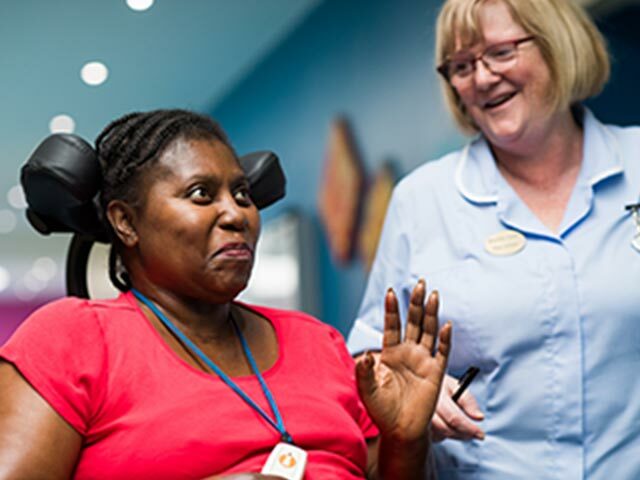 We deliver 24-hour high quality nursing services for people with complex neurological conditions and brain and spinal cord injuries. The qualified nurses are supported by a skilled and highly trained group of healthcare assistants. We specialise in treatments including tracheotomy care, PEG and suprapubic catheters. Our units have a very high staff to resident ratio which ensures that individuals are treated in a timely, professional and expert manner. We have a Consultant Neurologist who is supported by a GP and a Respiratory Consultant who advise and treat our residents. They work as part of the team and conduct regular reviews on site. The Speech and Language Therapy department assesses, diagnoses and treats communication and swallowing difficulties. We work collaboratively with individuals, families and other professionals to reduce the impact of communication and eating and drinking difficulties on the person’s wellbeing and ability to participate in everyday life. We are specialists in slow stream rehabilitation (level 2b). For inpatients this pathway runs for a longer period of time with less intensive therapeutic input allowing the individual to practise and consolidate newly acquired or relearned skills into their daily life and become as independent as they can. Outpatient services are available for those willing and wanting to continue their rehabilitation for a longer period. Complex disability management is also provided for individuals with more complex postural needs to maintain their physical abilities and be as comfortable as they can. 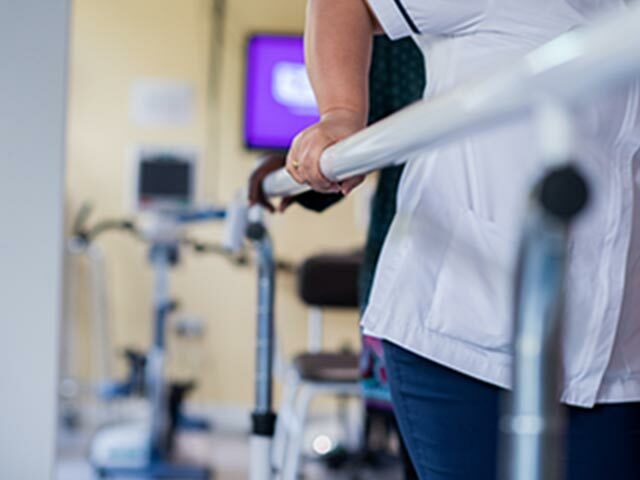 Occupational therapy provides practical and emotional support to facilitate recovery and overcome any barriers that prevent people from carrying out the activities that matter to them. This helps to increase their independence and satisfaction. Here at Marillac we use a person-centred evidence-based approach. An initial assessment of cognitive, physical and emotional wellbeing is carried out and treatment goals are set with the resident and, if they wish, a family member. Goals in personal care are carried out in collaboration with the Unit Care team. Domestic activities can be practised in our wheelchair-accessible kitchen. Sometimes specialised equipment is provided to overcome limitations. Discharge is facilitated by a home visit, so that equipment and minor adaptations can be organised by community services. Goals around building concentration and memory are facilitated in our state-of-the-art multi-sensory room, which is an ideal environment to engage people who are in a low level of consciousness. The Occupational Therapy team works with the multi-disciplinary team to ensure that treatment approaches enhance one another. We are supported by community dietician services which advise, prescribe and review our resident specialised diets and enteral feeds where needed and appropriate. As part of our holistic approach to care, the Activities team provides recreational activities to contribute to our residents’ sense of choice, wellbeing and fulfilment. Each week there is a full schedule of group activities including arts and crafts, music, bingo, cookery, movies and crosswords. Groups are facilitated by the Activities team and many are supported by volunteers. Family members are welcomed, especially at the regular events and performances which take place in our hall or in the street. Our thriving volunteer programme makes a very real difference to our residents. Volunteers help ensure that residents have the support they need to get the most out of our activity schedule as well as bringing important social interaction. As part of the Marillac volunteer team you can make a valuable contribution to your local community; there are several ways in which you can volunteer and your time commitment can be flexible. A Christian spirit and focus underpin all we do and we respect the multi-faith background of our staff and people who use the service. Pastoral support is available from the Pastoral Sister, who lives in the grounds, and she and all of our staff recognise and respect individual choice in fostering the spiritual life of Service Users. Regular Christian services are held in the chapel throughout the year and opportunities are created for private prayer or times of quiet reflection. We have a Service User Roman Catholic Chaplain and a visiting Anglican team, and we welcome representatives of other faiths. Sensitive personal support is on hand at critical times such as prior to and following the death of a Service User. Families often choose to hold a funeral or memorial service here at Marillac Neurological Care Centre. On these occasions we offer help in organising the funeral and preparing how the Service User’s life is commemorated and celebrated, including hospitality after the ceremony.